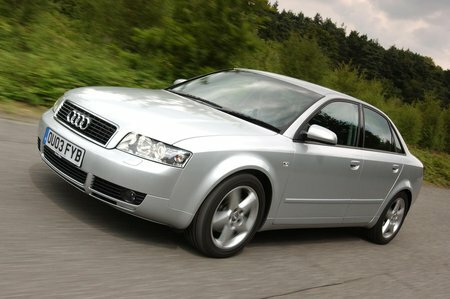 This Audi A4 saloon was launched at the end of 2000 and, although the model that followed it in 2005 looks completely different on the outside, it's essentially the same car underneath and is no more spacious inside. The A4 range offers a wide choice of engines, from a basic 1.6-litre petrol right up to a 339bhp 4.2-litre S4, with every kind of diesel and petrol engines in between. There are front-wheel-drive and quattro four-wheel-drive models, and trims include basic (no name), SE (our choice), and Sport (firmer suspension, and interior). We'd go for the 1.9 TDI 130 as the best all-round choice, although the 1.9 TDI 100 is still easy to live with, if a little less powerful. If you want something a bit more potent, the 1.8-litre turbo petrol is swift and flexible, and the V6s (diesel and petrol) are refined and effortless. Independent specialists are the best place to track down this generation of A4, but don't rule out car supermarkets or even private sellers. Some ambitious sellers try to cash in on Audi's reputation, so make sure you don't pay over the odds.